Just before Christmas we rolled up the road and into the village of Pinopolis, SC. We were just getting around to posting this photo when the local paper came out with an interesting article on this very spot. Mr. Normal Walsh has written a book on the village entitled, PLANTATIONS, PINELAND VILLAGES AND ITs PEOPLE. 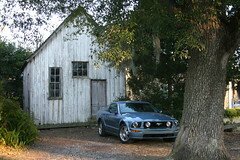 We're parked at a charming old structure which is next to the existing post office at Pinopolis. A photo by Walsh supplemented by those from P&C staff photographer, Wade Spees gives a view of this wonderful protected pocket village life in the upper reaches of the Cooper River's plantation district. As Rob Young's article points out, had malaria not been a scourge of the coastal swamp districts, there would have been no building in the pinelands which became Pinopolis. Many villages grew not so much out of what they had to offer, but for what they did not offer. Malaria was not on the menu at Pinopolis. Had there been no tuberculosis, there would have been no Woodlands Resort and perhaps no Summerville either. Summerville was promoted at an international medical convention in Paris back in the early twentieth century as one of only two places in the United States where one might be cured of tuberculosis. It was thought that the ambient vapors given off by the pines played some role in the cure, a prospect which is on equally sound footing with today's aroma therapy's advances in medicine. Perhaps some early developers had slipped the keynote speaker a bag of Francs under the table to promote that fantasy. Some traditions endure through the ages. But, will it hold up in court ? There are many blogs featuring Mustangs and other automobiles which promote engine modification, performance, speed, even racing, but this is not one of them. 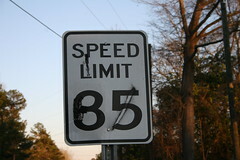 We've been clear in showing our respect for safety, courtesy and the posted speed limits on the roads we travel. Still....this happens to be car which if not employed for speed and performance, at least hasn't forgotten its heritage. It is, after all, genetically predisposed to such traits. We like to take in the sights, sounds, scents of the byways we drive. We're in no rush and have no deadline so there's no need for speed. There are, however, times when may drop our guard just a bit and fail to suppress the vehicle's natural inclination to pour the oats to the three hundred horses. Such a moment overtook us recently. During a gentle drive along a straight stretch in an unnamed county in South Carolina, we noticed blue lights in the rearview mirror closing fast upon us. An officer from an unnamed jurisdiction pulled us over, reviewed our credentials and shared with us the information which his radar had just shared with him. It was a number which we shall not share with you. Well, from the picture it would appear that it takes three men for the job: two to do the actual lifting and hauling while a third leans on a brick pillar and tries to figure out how we got an 80 inch sofa into the trunk of this car. It's a question worth asking. From the beginning, the Mustang's been long on hood and very short on trunk. 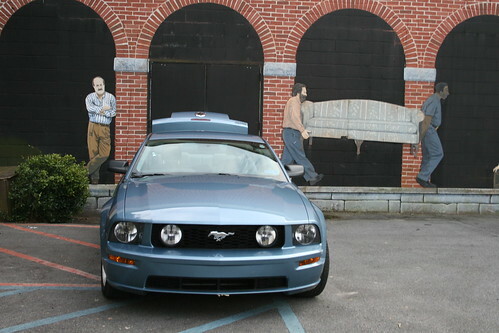 Over the years one reviewer held that the Mustang's trunk could hold only one six pack of beer and a bikini. In this model year we were gratified to see that Ford has installed a pull cord with a plastic handle to be used to open the trunk from WITHIN. There are many problems which may befall the owner or operator of any motor vehicle, but this is not at the top of if even on any list. We are at a loss as to how one might fall into this extremely small trunk, first fitting in that cramped compartment and then have the spring loaded trunk lid somehow slam shut upon one. We're not so sure that Ford considers this one of their better ideas. It smells a little like their loss prevention guys fear a lawsuit arising from an inexplicable fall into the trunk. There seems less than a million to one chance of this happening. Of course, the chance of bogus litigation so inspired is much, much stronger. How often do you walk by one of these cars and hear someone banging on the inside of the trunk lid yearning to be free? How often to you see a shyster lawyer promoting himself in a TV ad? Then there is the possibility that one may be overcome by criminals, forced into the trunk and driven to Kansas City. That escape cord ought to come in handy when the car is out running on the interstate around 90. There are those religious fanatics who might want to bury a fellow before his time. Who would want to be sealed in the trunk like Tutankhamen ? To have a so crowded a tomb and to be left with only a bikini and a six pack is hardly a Pharaoh's dream. Maybe the inside latch IS a good idea. When we think of a Silo do we think of a unit in which free flowing goods such as grain are stored or do we usually think of some tube beneath the ground somewhere in one of those square states in the West out of which our nuclear missiles might one day launch? The answer is neither. We are parked at the foot of a concrete silo at Rocks Pond Campground, an edifice which stands in stark contrast to the autumnal trees and the gazebo at the banks of Lake Marion in the background. You don't see a lot of concrete silos anymore unless you cruise the secondary roads of the double secret circuit of byways in very rural South Carolina. 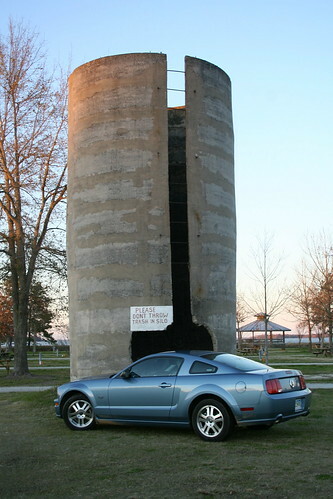 The keepers of the campground have left this old concrete silo in place perhaps as a gesture to the past, a piece of educational architecture for visiting families. More likely they didn't tear it down simply because nobody's going to pull it down for free nor will someone haul off the debris just for fun. Besides, they don't seem to need anymore rip-rap at the water's edge. We don't know. There are many warning signs at Rocks Pond, orders from headquarters as to what is prohibited and what is required of visitors. They were not erected all at once and are likely responses to a wide variety of mischief visited upon the grounds and structures by unmonitored children at play or unhinged adults after extended cocktail hours. In this case all are asked to refrain from tossing trash into the silo. This seems necessary since the gaping hole in the silo almost begs to receive the campers' refuse. It also looks like a mighty good place to burn the stuff. It's too inviting. It may be a trap. Silage is the stuff stored in silos which is often fermented grain intended as fodder for ruminant creatures. The management doesn't want folks to ferment any beer cans, second hand diapers, old newspapers or new potatoes in their free standing concrete silo, a sound policy with which we agree. Even after exploring the campground's oddly diverse appointments, the question still remains as to why this strange thing remains. Especially when no one is about the property, the mind tends to wander. We thought of the unexplained black obelisk in the movie, 2001, A SPACE ODYSSEY. Maybe this thing has some special place in this universe which cannot be known and must not be disturbed. We remember what happened in the movie to those guys who fooled around with the obelisk. The keepers of the grounds may just be trying to save us from a similar fate. Whatever the reason, this silo is part of the strange beauty of Rocks Pond, the campground from another planet. We are at the gateway to Rocks Pond Campground at Eutawville, SC. They planted their campers on land they claim to be the site of the oldest working plantation in South Carolina which dates to 1754. Rocks Pond is in a wide field of competition for this title. There are usually numerous qualifiers to such claims: oldest working plantation not featured in a movie, oldest working plantation growing candy apple apples, oldest working plantation employing legal immigrants, oldest working plantation no longer working...very hard. 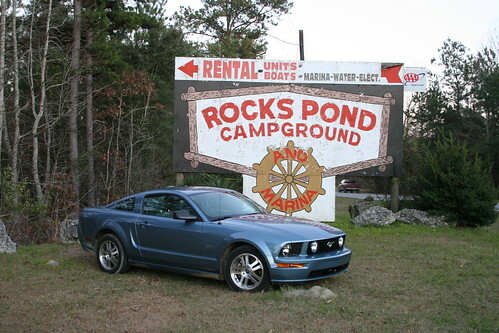 Regardless of the validity of their claim, Rocks Pond is certainly a funky old fashioned spread to which many camping trailers came, but never left. Gracing the footprint of resident campers' plots is a treasure trove of that seedy style of yard statuary which is almost endearing in its innocence and just this side of high camp. The Cloisters at Sea Island is safe from losing visitors to Rocks Pond for the moment, but this site is prime waterfront property on Lake Marion. What has been inexpensive access to boating, fishing, swimming and safe family recreation for many years may well be entering the phase of numbered days. More on Rocks Pond in subsequent postings.